How does a user place /usr/bin/systemd on the kernel line in grub2 bootloader? It seems to extend too far and requires a backslash. Adding to the kernel line in grub2 differs from grub? How? Edit: Change that file, and regenerate the grub config file. Your post adds init=/bin/systemd.. and requires regen of grub. I assume the regen is to make it permanent. My purpose is to make trial runs. I hope to add this to a raid0 system. and don't touch anything but the part you are adding. The disconnect with our posts is that he wants to do it on a one-off basis. He does not want to change it permanently. I think he is using Grub 2. For one-offs - at the grub menu on start up press the e key then use the arrow keys to navigate to the kernel line and press e again. Add the init=/bin/systemd to the end and press enter then b to boot it. Attempted the procedure but the structure in grub2 does not permit inserting that size of add-on. The added info is not printed completely on the kernel line. I suspect that another procedure is required for grub2 changes in the kernel line but have no idea what that is. EDIT: My system is unique however. The boot is made from a partition but the mbr has the grub2 installed. Therefore, I may have to change the boot partition params but they don't appear in the grub prompt directly. So it is likely that I cannot do the one-time systemd trial. One item in using the procedure you outlined is that the boot is enabled with f10 and "b" is not an option. Applied the systemd to an arch non-raid grub bootloader system . This produced a systemd boot to root prompt. Obtained log-in and started xfce4 successfully. Therefore I conclude the info in the wiki applies only to grub legacy. It may not be possible to use systemd in grub2 bootloader? Of course it is possible to use systemd and grub2 together. I am doing it right now, and also a lot of other distros have it as default. >>> However arch has grub1 as default, therefore it is your job to know the difference when reading the wiki. Also it is easy to test systemd by pressing e in Grub2 and adding init=/bin/systemd. Press f10 and it boots only once with systemd. Boot again and its gone. Edit /etc/default/grub the same way, and issue grub-mkconfig -o /boot/grub/grub.cfg to make it permanent. Prior to this posting I had been using /usr/bin/systemd which was in the wiki. Utilizing the ...init=/bin/systemd does generate a systemd result on a one-time basis. I guess I can proceed from this point. I probably made an oops in using the older entry. Although this post is marked solved, you didn't explain whether you successfully added the init=... statement to the kernel line, since it was too long to fit in the available space. Using the suggestions given above, I've modified the line, even inserting a "\" before continuing the next line, but get an error when pressing F10: "can't find command 's' "
This appears to relate to the word "setup" at the beginning of the grub2 code listed after "e" is pressed to edit it. Pressing e then ESC allows the system to boot normally, but obviously without any modifications to the command line. Assuming you're up-to-date (i.e. have systemd-sysvcompat installed) you don't need to modify grub to load systemd as init. That's the point - I don't have systemd-sysvcompat installed. I just want to test the impact of changing to systemd by temporarily modifying the kernel command at boot up. The problem is that any modification results in the "can't find command 's' " error. If you want it to be temporary, just select your normal boot entry in the menu and hit "e". Add init=/usr/lib/systemd/systemd to the command. Done that. Gives "can't find command 's' " on pressing F10. This is using GRUB2 which is up to date. I dunno what you're doing wrong here, but I've just tested it myself, and it works fine. One thing I noticed though, was that I don't have any mention of "setup" in my 'e' menu, or my grub.cfg. Please post your grub.cfg so we can have a look at it. Also, don't bother manually inserting '\'s to trail onto a new line, grub adds those in when the line overflows, as far as I can tell, it's just cosmetic. Well that looks fine to me. I've done some research, and it appears that someone else experienced a similar bug back in grub v2.00 beta3. Are you sure that the grub you have installed to the mbr is up-to-date? 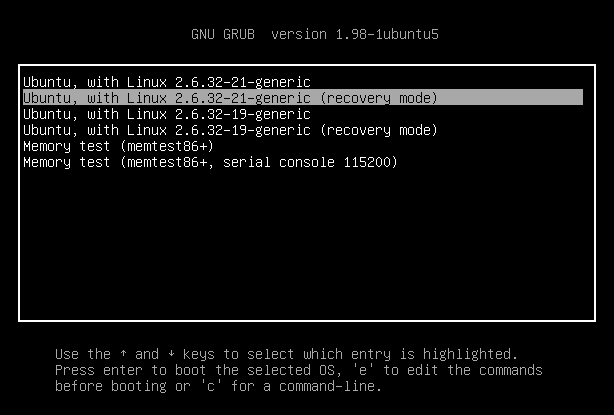 Note that upgrading the grub package in Arch doesn't touch the version you have installed to the mbr. No I'm not sure. How do I determine that? When you get to the grub menu, it should say at the top of the screen, like this. If it just says "GNU GRUB version 2.00", then you're up to date. Thanks WorMzy, you were right - I was using beta 3. Upgraded and boot time edits work as expected.